Road line marking machine, line striping machine, line painting machine for parking lot / road line / high way / sport field pitch grass field / school sports etc. 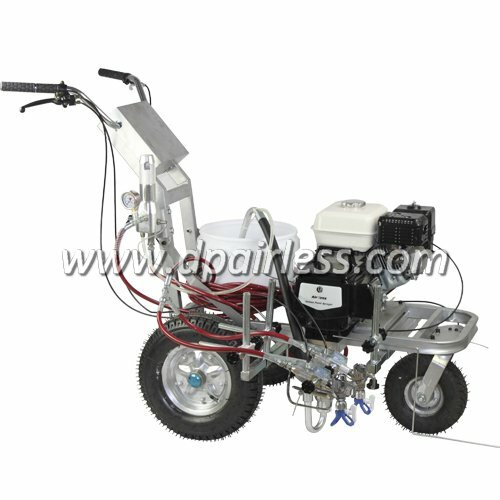 The Road Line Marking Painting Machines is a wheeled cart airless sprayer driven by a petrol engine. The spray gun (1 or 2) will be fixed on the side of machine, the position and angle could be adjusted so as to get different width / distance lines. The Road line marking machine will use a special Line Spray Tip, which make sure the both ends of the paint is equal to the middle. The Road line marking machines has 2 control handle for easily any-direction going, or just straight going. and another handle is for controlling the spray gun start & stop spraying. What’s the Difference between Thermoplastic and Cold Paint Line Striping?